While we are all familiar with the touching holiday tradition, not all of us have had the chance to receive a card from the past. Our client had such wonderful fortune when he found a number of paintings, each one a design for a greeting card, created by his grandfather, Victor Becker. 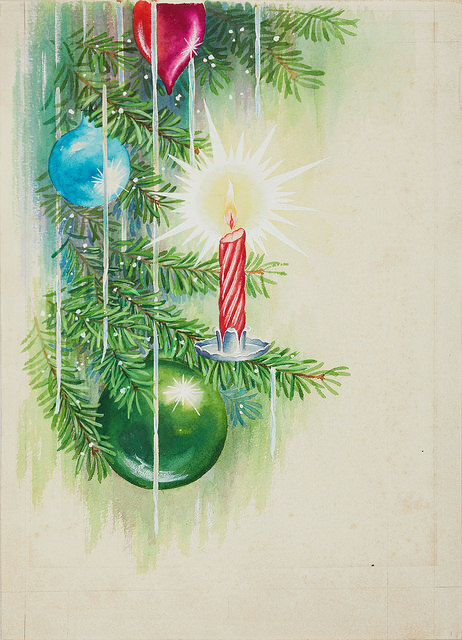 An artist working in the 1920s and 1930s, Becker created works for card companies such as Hallmark and others. Our client described how in the process of going through his father’s estate after his passing, he unearthed the pieces by his grandfather tucked under old expense reports kept in a trunk. Before finding the pieces, our client was not even aware of their existence, but once he found them he knew they had to be properly cared for so that they could last for generations to come. As he was the only member of his family present during the discovery, he decided to surprise family members with the works as gifts. After doing some online research, he found The Conservation Center, and a few of the works with the most noticeable condition issues were sent in for treatment. In order to restore these original card designs, our conservators began by thoroughly examining each piece. They found much of the damage to be age-related. The cards exhibited distortion, foxing, and age-related discoloration. There were pressure sensitive tapes on the perimeter edges, and two cards had tears. In addition, after years of being in closed storage, the pieces had developed a slight odor. To treat the cards, our conservators surface cleaned them to remove any surface soil. The pressure sensitive tapes were then lifted off using the proper conservation techniques. After being stored in an air scrubbing chamber for several weeks to remove the mildew odor, the cards were humidified and flattened to conservation standards. Completed just in time for the holidays, our client has noted that he plans to match up the card designs with his family members’ interests, and surprise them with the gift. A particularly special gift will be one of the card designs that our client plans to pass on to his one-year-old grandson. The project has inspired our client to learn more about his grandfather’s art, and to seek out the cards that were created from his original art. We were delighted to help conserve these cards for future generations, and to be a small part of one client’s holiday joy. From all of us at The Conservation Center, we wish you a very happy holiday season!